As the average weight of American adults (and Americans in general) continues to rise, weight loss is a topic that is increasingly on the public’s mind – and due to societal expectations regarding female beauty, this is especially true of women. This article will offer a short introduction to some of the leading fat burning supplements for women, with an emphasis on evaluating effectiveness and safety. While no one product or set of products will be right for everyone, with a little effort and experimentation, anyone can find a supplement or set of supplements that will be useful to them in combination with a healthy diet and regular exercise. ProLab Caffeine is a dietary supplement which has been specially formulated to increase the body’s metabolism naturally to help a person lose weight. The special concentration of caffeine in ProLab Caffeine dietary supplement pills works on the body to deliver great results. The caffeine contained, energizes the body so that it burns fat very quickly. This can be a valuable boost to any woman who is trying to lose weight. Caffeine also is a well-documented stimulant. After taking the supplement you will feel more energized and alert. So, a person using ProLab Caffeine supplement for weight loss will also get many other side benefits as well. Many online reviews highly praise this caffeine supplement as one of the best on the market. 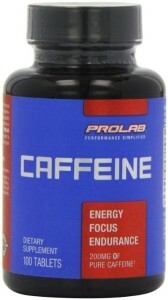 ProLab Caffeine supplement is a great way to see better results faster if you are on a nutritious healthy diet. Caffeine is used in many dietary supplements which are formulated for weight loss. ProLab Caffeine supplement pills also contain calcium. Proper amounts of calcium also help boost weight loss. However, calcium is usually obtained through dairy products which can be high in fat. Even low-fat products still contain some calories. ProLab Caffeine delivers give a great boost to weight loss, without any extra calories. What are some of the amazing features of ProLab Caffeine? The main ingredient in ProLab Caffeine is caffeine. Each tablet contains 200 mg, which is around the same amount of caffeine in two cups of coffee. Each tablet also contains 75 mg of calcium. It has been scientifically proven that calcium can help lost weight as well. For many women, especially those who are post-menopausal, calcium is an important supplement in the diet. Caffeine stimulates the central nervous system. Although caffeine is associated with raising blood pressure, studies show that it doesn’t always have this effect on those who regularly take caffeine supplements. The caffeine supplements help to break down fats. For weight loss, caffeine increases the body’s metabolism rate and this helps to burn calories. Caffeine also contains chlorogenic acid which can help to slow the absorption of carbohydrates. If a person is also exercising to lose weight, he/she will burn even more fat if caffeine supplements are taken. Recent studies have highlighted how calcium can help a person lose weight. It has been proven that by introducing calcium to a diet, weight loss happens quicker. Another study showed that when calcium intake was increased, a person could eat more calories without putting on weight. Calcium is also an important diet supplement to keep weight off. One study on overweight women showed that over a period of 18 months each 100 mg of calcium per day prevented about 3.5 pounds of regained. As with all supplements containing caffeine, it is important to check the body’s tolerance to it. If you suffer from high blood pressure or cardiac conditions, you should consult with a doctor before using. Recommended dosage: 100 to 200 mg every 3 to 4 hours. Please note: as with all dietary supplements which contain caffeine, it is important to stop taking the supplements for 2 weeks every 6 weeks. Green Tea Extract Supplement in a unique product among the many weight-loss supplements on the market because it is a fat burner which is caffeine free. It also contains Vitamin C and these ingredients work together to help the body burn fat quicker. Green Tea Extract Supplement has been designed to help men and women lose weight quickly without the side effects of a large dose of caffeine. This product will especially appeal to women who want to lose weight quicker but keep to a healthy lifestyle regime. Much of the time, caffeine can have negative side effects on people and the caffeine-free Green Tea Extract Supplement will attract many who can’t take caffeinated products. The supplement pills are also vegetarian and gluten-free. The Green Tea Extract also contains a powerful dose of Vitamin C. These two ingredients work together to provide the body with amazing antioxidants which help keep the body healthy and strengthens the immune system. Many times, women and men who want to lose weight, but have other health issues like high blood pressure, high cholesterol, or other heart-related conditions can’t take many of the caffeinated fat burning supplements that are on the market. However, Green Tea Extract Decaffeinated Weight Loss capsules actually lower cholesterol, reduce the risk of heart disease and can improve brain function. So, these Green Tea Extract supplement pills have many proven health benefits aside from just weight loss. The fact that the dietary supplement contains decaffeinated green tea extract means that you get also the goodness of the extract without the side effects of caffeine. The Green Tea Extract Supplement Decaffeinated Vegetarian Pills for Weight Loss contain 120 capsules with a potent 725 mg dose of caffeine-free Green Tea extract. Each capsule also contains 60 mg of Vitamin C.
To back up its claims, the product also comes with a full 100% money-back guarantee if you are not satisfied with the results. 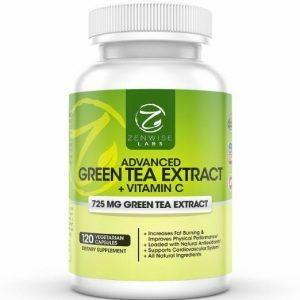 The two main ingredients of Green Tea Extract Supplement are 725 mg green tea extract and 60 mg Vitamin C.
Green tea has been scientifically proven to contain powerful antioxidants and fat burning properties. Green tea has also been shown to reduce and control blood sugar levels, so this can help prevent and reduce diabetes. Various studies have shown that green tea can have a significant impact on the reduction of certain cancers. The main catechin in green tea is EGCG which helps the body break down stored fats. Although decaffeinated green tea has slightly less EGCG, there is still enough to provide significant weight loss benefits to users. Vitamin C is a well-known powerful antioxidant which boosts the immune system. It can also help people with various heart conditions like high blood pressure, high cholesterol and prevent heart attacks. It helps with weight loss because when you exercise it helps the body break down stored fats quicker. Suitable for both men and women who want a healthy way to lose weight. Sheer Thermo is a specially designed fat burning dietary supplement which speeds the body’s metabolism to burn fat quicker. It uses stimulant and non-stimulant ingredients to assist both men and women to lose fat. Sheer Thermo fat burning thermogenic supplement works in a way which increases the body’s metabolism. This is called the thermogenic process. The result is that these dietary supplement pills stimulate the body’s natural functions to burn fat. Sheer Thermo fat burning supplement is branded as the “#1 best fat burning thermogenic supplement.” The claims are backed up by the specific ingredients used in the special formula. The supplement contains Green Tea Catechins, Yohimbine, 5-HTP, and caffeine. These ingredients work together to attack belly fat, increase adrenaline, give you more energy and break down fat cells. Usually thermogenic fat-burners use ingredients which all do the same thing – increase the body’s metabolism to burn fat. 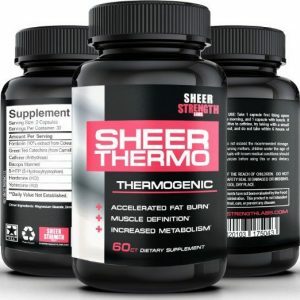 However, Sheer Thermo has included more ingredients which have unique fat burning properties. Sheer Thermo fat burning supplement contains clinically proven ingredients which have been tested to show weight-loss benefits. This means that users can fully expect to see tangible results when using the supplement. The effect will be increased when just in conjunction with a nutritious diet and exercise. These claims are also backed up by the company’s 100% guarantee for effective results. Unlike many other fat burning supplements which tend to just concentrate on boosting the body’s metabolism, Sheer Thermo dietary supplement contains a mixture of various ingredients which both boost metabolism but also have fat-burning properties. The active catechin in green tea helps to break down stored fat in the body. This also aids in the reduction of belly fat. Green tea also contains powerful anti-oxidant properties. Together with caffeine, it increases the breakdown of stored fats even more. Caffeine a scientifically-proven stimulant and much research has been carried out on how it affects the body and mental processes. It is found in many fat-burning supplements. Some studies suggest it doesn’t increase the blood pressure of those who take it regularly. This has been proven to boost the body’s mеtаbоlіѕm to burn more calories. When used in supplements with caffeine it increases fat loss. This works to speed up fat loss especially when exercising. It is also a known aphrodisiac and can boost ѕеx drive. There are also other powerful fat-burning ingredients like Forskolin and Hordenine. As with all supplements containing caffeine, it is important to do a tolerance check before taking the full dosage. People who have high blood pressure or heart conditions should consult with a doctor before use. Recommended dosage: One capsule in the morning and one capsule at lunch time. Avoid taking the supplement at least 6 hours before sleep. 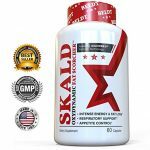 Oxydynamic Fat Scorcher by SKALD is a dietary supplement pill which has been designed to help men and women lose weight very effectively. SKALD: Oxydynamic Fat Scorcher works to trigger, what is called, the thermogenic processes of your body. The Thermogenic process is basically where the body’s metabolism is raised so that fat is processed much quicker. This means that these pills will help burn fat using the body’s own natural functions. Although these diet pills have been designed for elite athletes, they can be used by anyone, including women, wanting to lose weight fast. They are some of the best fat burners that are on the market today. The dietary supplement pills work to produce more energy in the body and can improve endurance. SKALD Oxydynamic Fat Scorcher is unique in that it also relaxes and expands the respiratory airways. This allows more air to flow to the lungs. It suppresses hunger and reduces appetite. This is an important factor for anyone wanting to lose weight. Increase the body’s metabolism. This results in fat being burned quicker. Helps with blood circulation and strengthens the immune system. Air circulation in the lungs is improved. A rich source of amino acids. The claims are backed up with a 100% money-back guarantee. So you can buy these fat burning pills with confidence. The main ingredients in SKALD: Oxydynamic Fat Scorcher are caffeine, green tea extract, white willow bark, citrus Aurantium, and black pepper extract. Although many of these ingredients are also in other fat burning supplements, Oxydynamic Fat Scorcher has these in more concentrated amounts. So, it will work even quicker. How do these ingredients help burn fat? This is one of the main ingredients which stimulates the thermogenesis process in the body. This increases the body’s metabolism and helps to burn calories naturally. Caffeine also increases lipolysis, which is also important in weight loss. Green tea has many beneficial uses in the body. However, when used together with caffeine it can speed up the breakdown of stored fats and carbohydrates. Therefore, the combination of caffeine and green tea is very important. This is well known for its anti-inflammatory properties. But, it is also an important ingredient to speed up the body’s metabolism. The supplements also contain essential amino acids which help, not only in keeping the body healthy, but also helps stimulate serotonin and dopamine in the brain. At the start, take one capsule on an empty stomach about 15-30 minutes before breakfast. After 5-6 hours an additional capsule can be taken. 1-2 capsules in the morning. After 5-6 hours take ONLY 1 capsule. In this short review, we have examined some of the most popular of the current leading fat burning supplements available for women concerned about their weight. There are many more that could have been examined (and that likely will be examined in a future article), including aspirin, capsaicin, ginseng, and vitamin D. It is important to emphasize that no one supplement or combination of supplements will be right for every consumer, and that none of these supplements are a substitute for exercise and a healthy diet. On the other hand, with careful attention to her mind and body, any woman would likely benefit from one or some of these products. Here’s to your health!